Having left Egypt, the story of God’s people was not nearly finished. God had already promised Abraham and his descendants a new land. They would leave slavery and enter into a land flowing with milk and honey. The time from the former to the latter could’ve been shorter, but the people feared more than they trusted. Moving into the promised land would not be easy for their were enemies of God in the land and they were strong. This created doubt and fear and people even wished they could turn back. This reluctance to follow where God would lead–even though he had just given them freedom from and victory over the great power of Egypt–led to a time of wandering. Forty years passed before they entered the promised land. It was a place of grace, for they reaped the harvest of another’s work. They did not earn or deserve the blessing. It is just as we receive the blessings of Jesus, one who has done all the work for us. In week three we took a trip down to Egypt. Although God’s people had spent 400 years in a foreign land and were under the great burden of slavery, God had not abandoned them nor his plan. He leads them out of Egypt and set them in the direction of the Promised Land. God did great wonders in their sight, but the people continue to waver between faith and doubt. Not long after God delivered them they turn to false idols. Their great sin is a danger to their on-going existence as God says he’d be tempted to destroy them if he were to be in their midst. But Moses pleads with God to stay because of their sin. God’s people are a stiff-necked, stubborn, sinful people. But that is all the more reason we are desperate for God to be with us. This longing for God’s presence and guidance is a deep desire within us. Our sin is a barrier, but in Jesus Christ God has done all that was needed to remove our sin making it so that our longings can be fulfilled. We are in the final week of this 10-week reading plan so it is now or never for review. I’d thought we would look back and try to remember each week a bit before we reflect on our final readings. The idea was to have a plan that in a relatively short time introduced a great, overarching theme of Scripture. I wanted us to see that the Bible is cohesive. God has a plan and has had a plan since the very beginning. And we read this in week one. Before the world was made, God had chosen us in Jesus Christ. Our other readings emphasized that we can actually believe the Bible. We aren’t left in the dark about who God is and what he is up to. God’s word is trustworthy and points us to this great plan God has in Jesus Christ. In reading the Bible we trust that God will continue to speak to us, at times with comfort and at times with very challenging, piercing words. But the whole of it is his inspired word. We have skipped over some books and about forty years and find ourselves reading the first chapters of Deuteronomy. But don’t think you’ll be in the dark. 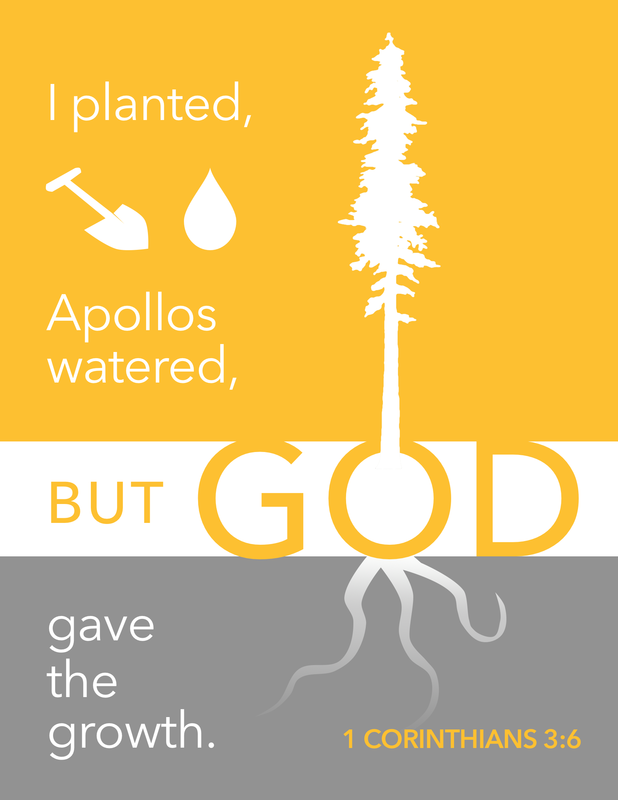 Moses here does a great job of recapping where they have been and what God has been up to. They left the mountain and wandered for forty years because of their lack of trust in God and now as they have endured God’s discipline, they stand at the threshold of the promised land. Israel is again given the opportunity to walk in faith into the land that God has prepared for them. But not before a real hard look at themselves in the mirror, courtesy of Moses. 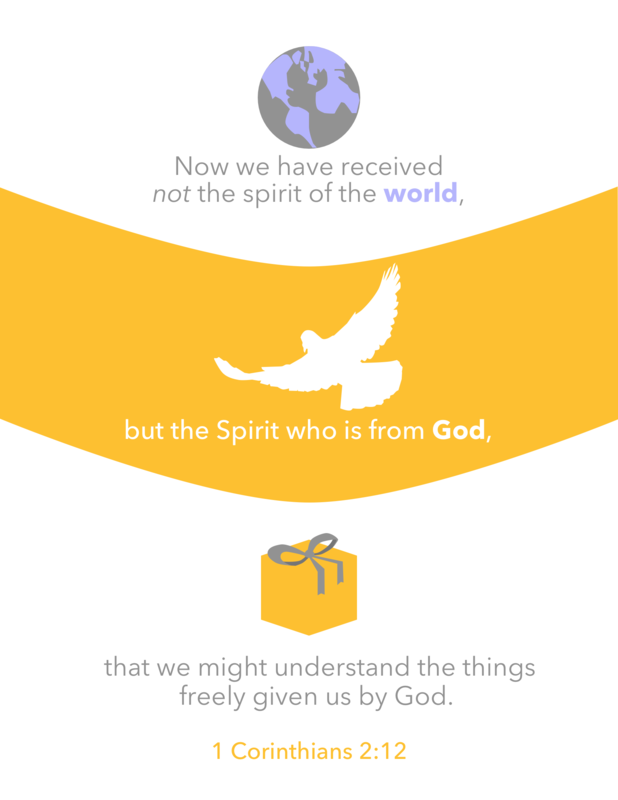 Since we finished reading 1 Corinthians just last week, what do we do now? The reading plan was pretty clear that we finished, but so you know, you are allowed to return to 1 Corinthians. You can reread it to your heart’s content. If you want some methods of review, here are a few. You could read it. Slowly. Again. Not a complicated method. Maybe you could try a different version this time around. You could use the Bible studies to go in-depth. Besides that link to the website, you can also download them all as one PDF here. Using the Bible visualizations you can review the memory verses. We did this in our final meetings of the Bible study and tried to remember what the context of those verses were. 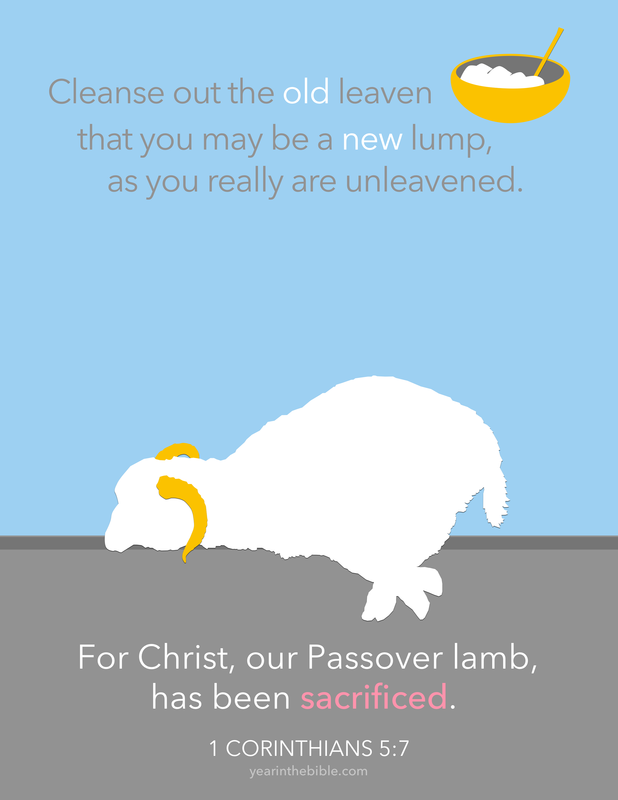 It’s great to know these verses, but it is even better to remember why Paul was talking about Christ as our Passover lamb or why he talks about eating to the glory of God. Again, if you want to download them, here is a big (20 mb) PDF you can use. Something else we did to review at our study was like a puzzle. I stripped 1 Corinthians of all its verses and chapter headings and then mixed up all the chapters. The goal was to be able to put the letter back in order. You can use this to try it out for yourself. I’d recommend stapling the few chapters that are two pages together so that you have sixteen units to put in order. If visuals aren’t your style for memorization or you want something more portable, print out these memory verse cards, cut them out, and flip through them. Have another idea? I’d love to hear it. Now halfway through 1 Corinthians, let’s get nostalgic and take a walk down memory lane. 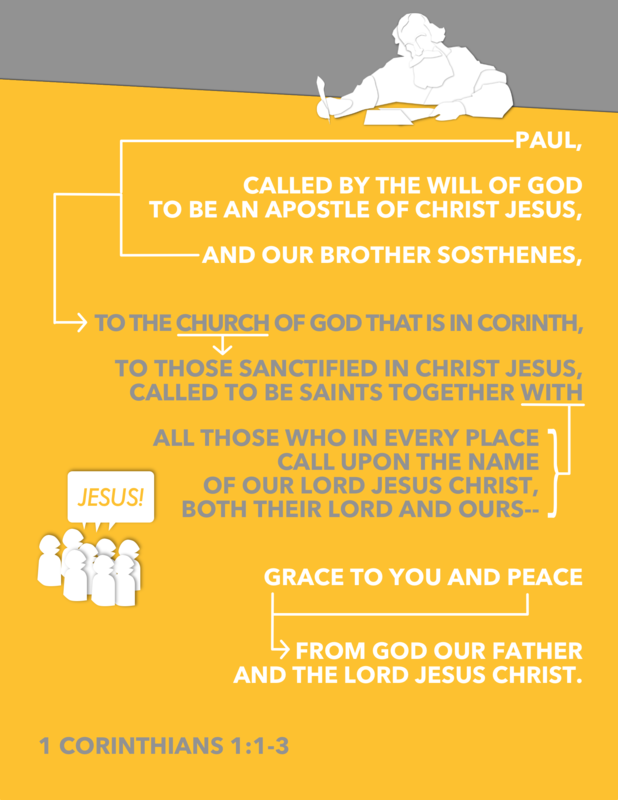 Here we are introduced Paul, who writes with the authority of one who is sent by God, and to Paul’s letter to the church in Corinth and the saints every where who call upon Jesus Christ as Lord. It will be a letter tailored for Corinth, but in no way limited to this one group. In this section we also find out one of the problems arising in this church, that is there is quarreling and divisions among the body as people are aligning themselves to certain teachers. Paul comes down clearly against this. 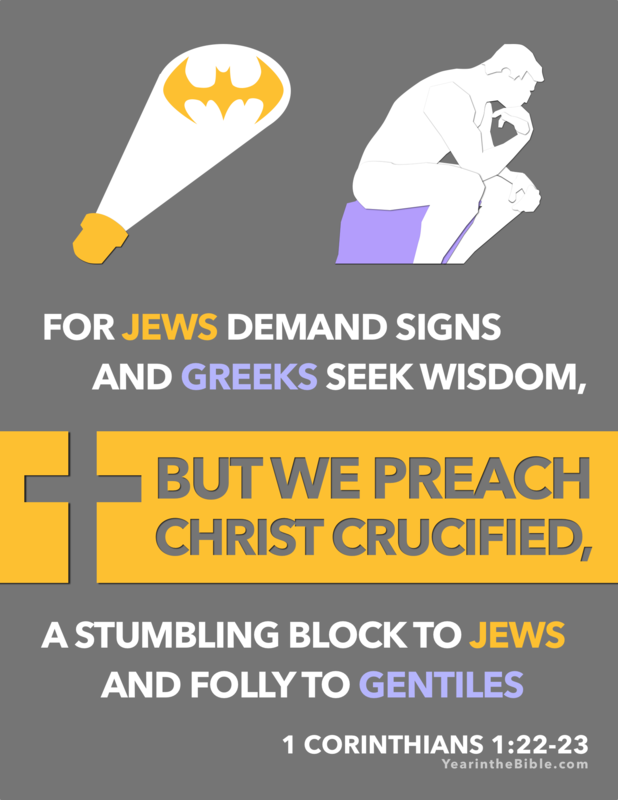 The response to the issues of Corinth is the cross of Jesus Christ. The cross is a message that is not always attractive, indeed it appears foolish to the world. But the “foolishness” of God is wiser than men. Therefore, we shouldn’t boast in any associations with a certain teacher, nor in ourselves. If we are to boast, we should only boast in the Lord. The cross is the wisdom of God and in chapter two Paul writes how we receive this wisdom from God by his Holy Spirit. The natural person doesn’t understand the things of the Spirit, but we can have judgment and discernment because God has gifted it to us. Having taught on the wisdom of God in the cross and from the Spirit, Paul returns to the issue of divisions in the church and seeks to correct Corinth’s view of Paul, and other teachers. Paul is just a worker, given a certain assignment, just like Apollos, but through it all it is God who truly is at work. 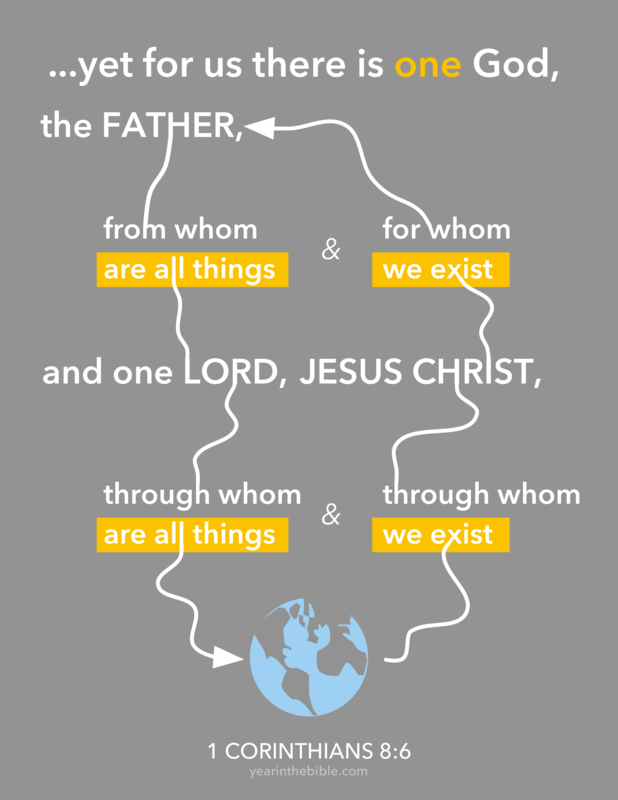 They work together with a common goal, always building upon the one foundation of Jesus Christ. Paul continues on the topic of how the church should view its teachers, like Paul or Apollos. Their incorrect view has led to boasting and being puffed up. Instead Paul wants them to follow his example and make sure they do not go beyond what is written–which is an especially troublesome territory that lends to speculation and arrogance. He doesn’t want them to think that they can continue in the way that they have gone without any oversight. Paul has some stern words about the manner in which he’d return with rebuke. Corinth has had issues with divisions and quarreling and now Paul mentions the sexual immorality that has made its way into the church, like a leaven that is affecting the whole dough. To make matters worse, some think that their tolerance of sexual sin is to their credit and they boast (see a pattern?) in their behavior. Paul points them again to the cross, arguing that Christ sacrificed himself as our Passover lamb to remove the leaven–the sin–from our lives. He says the church shouldn’t embrace the sin, the very thing Christ died to remove. In fact, Paul says to cast the man who has committed the sin out of the church. The wisdom the church ought to have received from the Spirit is not being manifested in the body as they are neglecting their call and responsibility and instead are taking their issues and submitting them to secular courts. This is a poor witness to the world about the call of God’s church to be judges of all things, and it is shameful that the world sees the sinful practices that should not be part of the kingdom of God. Perhaps quoting the Corinthians’ argument, Paul confronts the notion that freedom in Christ makes all things permissible now. 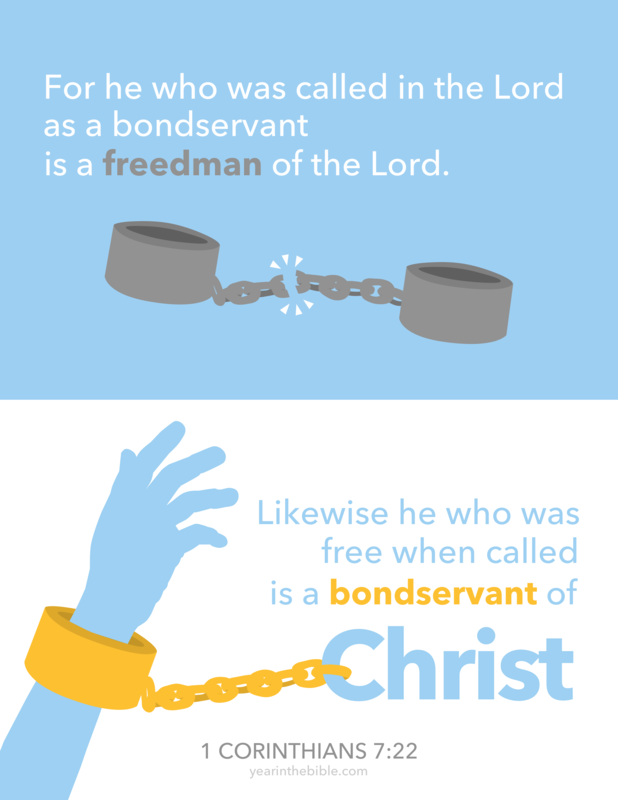 It is true that we have freedom in Christ, but we are freed from sin, not for sin. Some practices may be allowed, but that does not mean it is good for the person or for the body. After all, our body is not our own, rather we have been bought with a price. 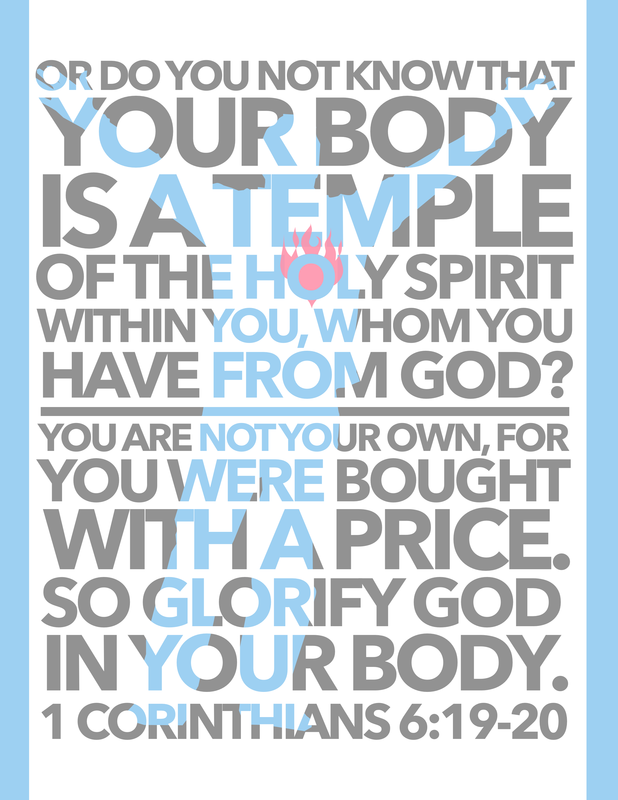 The believer is now, miraculously, a temple of the Holy Spirit, so we should glorify God with our bodies. Having discussed sins, and specifically sexual sins, that are not in line with the kingdom of God, Paul turns toward some questions the Corinthians had and teaches about what sort of sexual relationships are appropriate. 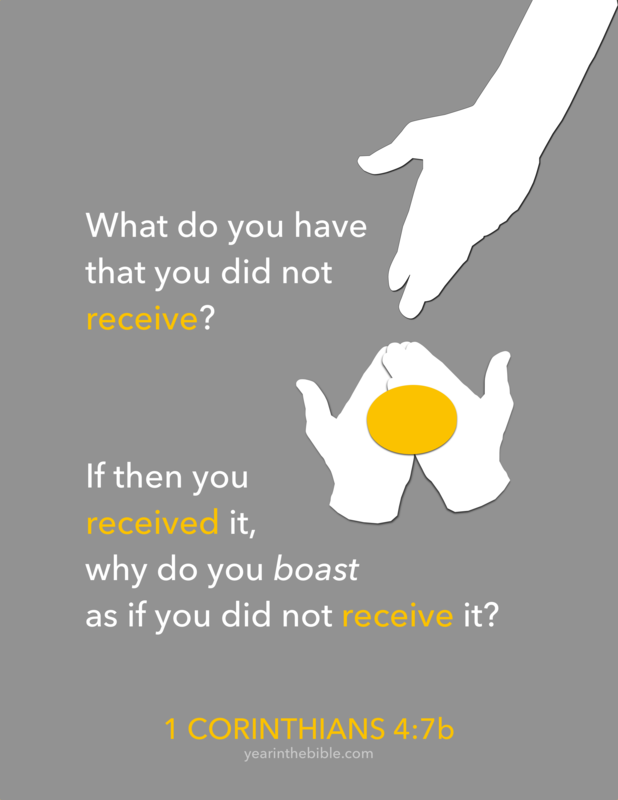 He relates these questions to the broader issue of our calling in Jesus Christ. Whether married or single, and Paul then goes on to include Jew or Greek and slave or free, we all have callings. Paul may encourage singleness, but to him it comes down to our ability to serve God wholeheartedly. The topic of freedom in Christ comes up again and this time in relation to the eating of food offered to idols. Here Paul urges people to consider sacrificing their “right” to do what is greater: to love their brothers and sisters. If they use their knowledge to disregard the needs of others, they are puffed up and sinning not only against their fellow believer, but against Christ as well, since we are all members of his body. So there you have it. Eight chapters down, eight more to go. If I missed something that stood out to you, don’t let me get away with it! Paul now in chapter nine continues the discussion of our freedoms and rights, and how we at times ought to sacrifice our rights for a greater purpose. Having now finished eight chapters of 1 Corinthians we are right in the middle of Paul’s letter and it is a great time to look back at the first half. I was going to give a bit of a review in this post, but it’ll have to wait for tomorrow. But perhaps that’s serendipitous. It’ll give you time to see what you can remember on your own. See if you can remember something from the beginning, the next couple chapters, and then the most recent ones. Do certain themes stand out? Can you especially remember a certain passage? Did God bless you by your reading and study in some way? In terms of the memory verses, do you have any of those stored away? As you review the verses from each week, which you could do visually here, does that help you recall more from the chapters that the verses are in? As you take the time to do this, I’d absolutely love to hear how it goes. What has helped the most, what has stuck with you, what more can we do or what can we do differently? Let me know in the comments or via email or if you’re in the neighborhood, stop on by the office. A good way to look back and review our readings is with our memory verses. I’d encourage you to reread the previous sections as much as you can as we work our way through 1 Corinthians, but these short verses can be a fine short cut. If you haven’t memorized it, but have glanced as the visualizations and read through a few times, you may know more than you realize. I’m going to put the verses below, but missing about half of the words. See how you do and if you’re able to fill in the blanks. I’ll leave it up to you to find your Bible and check your answers! 3 ________ to you and ________ from ________ ________ ________ and the ________ ________ ________. A ________ ________ to the ________ and ________ to the ________. that we might ________ the ________ freely ________ us by ________. I ________, Apollos ________, but God ________ ________ ________.